It's As Simple As Ready, Aim, Relief! standing office model, as well as a portable, mobile model. Neuro Reflex Stimulation (NRS) Therapy is a method of stimulating the body’s own neuro-reflexive responses to combat pain and is a technique of choice for the daily treatments of both acute and chronic pain. Neuro Reflex Stimulation (NRS) is an intense cold therapy that uses hyperbaric medical CO2 gas. The gas streams out of treatment gun as fine spray, which hits the skin at a temperature of -108.4°F and a pressure of 1-2 bars lowering the skin temperature to between 39°F and 35°F within just 30 seconds. This abrupt temperature change is the key to NRS and it generates a neuro-reflexive response in the body. This response results in an increase of blood flow in the treated area, whilst reducing the contractions of pro-inflammatory mediators (i.e. prostaglandins and histamines). In addition, the decrease in surface temperature combined with the pressure of the gas has an effect that is similar to a manual lymphatic drainage. Featuring an intuitive user interface and compact, ergonomic design the Cryofos Office model has been designed to deliver swift, economical, and safe in-office treatments. No need to dedicate a room in your office to NRS Therapy. 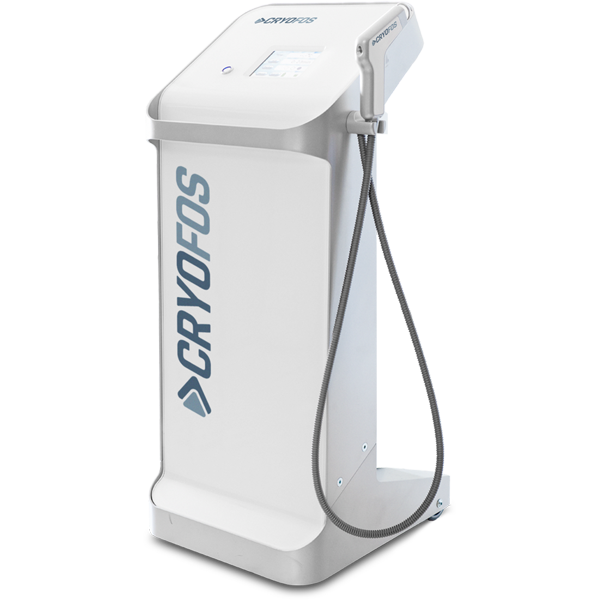 The compact design of the Cryofos Mobile model allows you to bring the treatment to the patient. NOTE: The Cryofos models are Class II Medical Devices and Federal law restricts it to sale by or on the order of a licensed health care professional. If you are a patient, please speak with your doctor if you think Neuro Reflex Stimulation (NRS) Therapy with Cryofos can help you.